The introduction of iOS 9 brought on a lot of new and useful features. From search in settings, to low power mode, many of these new features fit in perfectly with our daily routine. However, one feature, that was designed with good intention, has spelled disaster for many users. 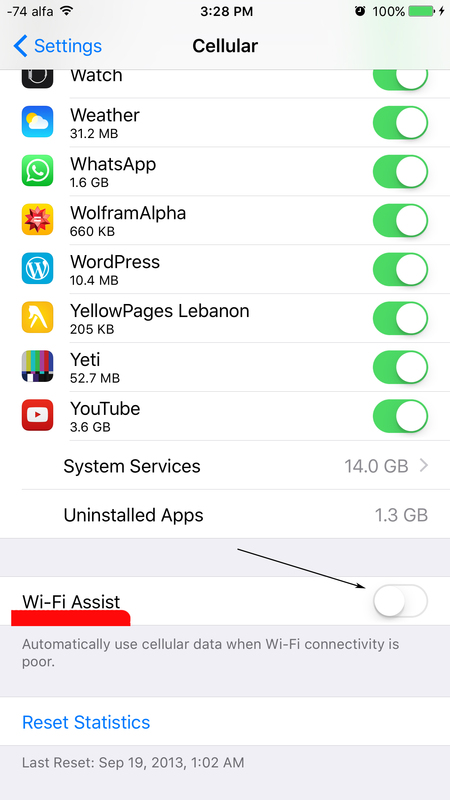 Wi-Fi assist is a feature in iOS 9 designed to aid a poor Wi-Fi connection with your data connection. This means that if you are connected to a slow Wi-Fi connection, your iPhone will automatically use its data connection to complement the slow Wi-Fi. This is very beneficial for users on unlimited data plans, but for users who have a monthly limit, Wi-Fi assist will (most probably) be responsible for the price hike in your next bill. Now that you you know what Wi-Fi assist is, you can choose whether or not to keep it enabled. If you decided to disable it, navigate to Settings -> Cellular, scroll all the way down and disable the Wi-Fi assist toggle. This entry was posted in iPad, iPhone, iPod and tagged 9, assist, consumption, data, ios, wifi. Bookmark the permalink.